On a commuter campus there aren’t a lot of opportunities for student forums, but with the new addition of the Dream Tree to the quad, SF State now has a place to connect the dreams and hopes of everyone on campus. 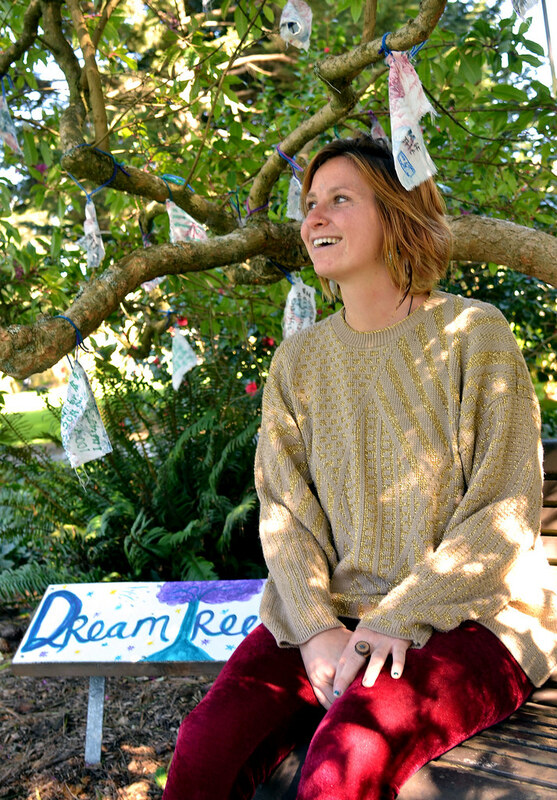 The Dream Tree is a place on campus where students can write and hang their dreams upon a tree for fellow students, staff, and visitors of the campus to read. Ken Burrows, a holistic health assistant professor who worked with the tree’s creator, SF State student Danielle Barnett, has high hopes for the tree’s impact on campus. “Right now you see largely the cultural lacking of a real shared moral story that keeps us together, so in some way, bringing out the dreams, and finding the best of our dreams and sharing them is really part of what could move us toward a future that would make a lot more sense than we’re in,” Burrows said. Barnett, a communications major, signed up for Burrows’ holistic health internship class after recommendations from her colleagues. What she found in the class was a platform to create the project that she’d been in love with for the past year. The Dream Tree can be found in the quad, labeled with a painted sign. The idea of the Dream Tree is to take out one of the cloth pieces in the mailbox, write one of your dreams or aspirations on it, and use the attached string to tie that dream onto the tree. So far, many spots on the branches have dreams strung onto them. “There’s a little red mailbox attached to it (the Dream Tree sign), and you can just come in and open it up, and it says ‘Share Your Dreams.’ I want everyone to share their dreams on this dream tree,” Barnett said. Burrows, the internship class teacher, assigns each student an assignment to create a project related to holistic health. There are several types of projects besides the Dream Tree, such as weekly massage sessions or feelings circles, and events such as Create to Relate, an event that had different holistic heath exercises in the campus quad for students to take part in. Barnett credits him with helping her come up with the idea for using the cloth as the medium for writing the dreams. Burrows doesn’t take credit for the idea, but is curious about the tree itself and loves the idea. “Arts, I think, are extremely powerful and often misunderstood by a campus that’s naturally devoted to academic studies, but arts really help awaken imagination, and help us get in touch with and make real certain aspects of our lives,” Burrows said. Creating the Dream Tree wasn’t as simple as painting a sign. “I had to go through grounds department, I had to go through a few different hoops to make it happen and make it like an official thing,” Barnett said. She had to dedicate herself to constantly approaching grounds workers and emailing the ground operations manager, John Cahill, until she finally found the office and had the chance to talk to him. Students have definitely been noticing the Dream Tree. The branches are already starting to fill up with all the attached dreams. One of Barnett’s fellow holistic health colleagues saw other students discover the tree. Barnett is hoping the word will continue to spread, as she’s planning different events for the Dream Tree. All students are encouraged to post a dream on the Dream Tree, or at least take a look at the dreams already written. Some may be surprising, or could be as true to the reader as the writer. The only way to find out is to stop by and check it out.